Image | This entry was posted in economy, government, inequality, politics and tagged Bernie Sanders. Bookmark the permalink. 4 Responses to We’re Number One! We were doing well in the decades after WWII when the wealthy were taxed at a marginal rate up to 90%. Then came Reaganomics and we’ve been heading downhill ever since. There’s much more we’re number one in, but hey, how much can you fit in one poster…. 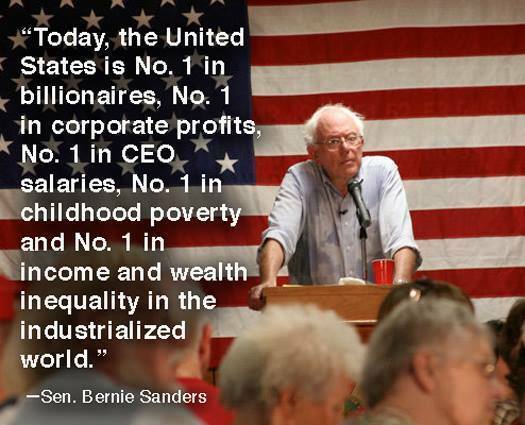 Well, Bernie is right, but it should come as no surprise because the USA has had the largest number of the richest people in the world since about 1880 and the largest number of ultra high paid CEO’s during the same time period. The only new thing is not new, but only a repeat. That is the extreme wealth inequality. The USA is about the same as it was for ten years of the Great Depression and for about twenty years of the original Depression from which “Depression” got its name. But I know that you knew all that before I said it.